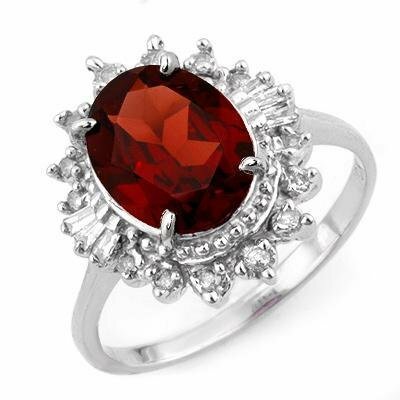 Click here to receive my email newslettersCertified - Genuine 3.45 ctw Garnet & Diamond Ring 10K White GoldBeautifulCertified Genuine 3.45 ctw Garnet & Diamond Ring 10K White Gold SUGGESTED RETAIL VALUE: $1,230.00This ring will be custom made for you by jewelry manufacture Please allow 12-17 business days for delivery via USPS. Size 6.75Item: 1963-WDiamond: 14 RD & BGT cut @ 0.45 ctwClarity: SI-IColor: H-KGemstone: Natural GarnetGemstone color: RedGemstone quality: Good-to-Very GoodGemstone Cut & Weight: 1 Oval cut @ 3.0 ctwMetal Purity & Color : 10K Gold-WhiteGold weight: 3.25 gramsRing size (US): 6.75Dimension: Approx. 9/16" x 1/2"Items usually processed within 1-2 days of cleared payment.This piece will be custom ordered from jewelry manufacture we are working with.Complete delivery turn around time 12-17 businessdays via USPS.For additional $30.00 wecan re-size this ring for you to any size.If you like this ring, do not wait, justmake your buy now!Please note once you win the item, you are in alegalbindingcontract. Please arrange payment for the item, we do not allow asking order cancellation. If you have any questions, please feel free to contact us before leaving feedback. Thanks!